Alexandria Ocasio-Cortez is self-destructing today. After she was hit with an FEC investigation involving the alleged dubious dealings by her campaign transferring almost $1 million into slush funds, she now is saying the United States should not have used force against the 9/11 terrorists. The former bartender went as far as to say that the war in Afghanistan was a “mistake” and that “non-intervention” with the Islamic terrorists was the answer. Well, she instantly got destroyed. Alexandria Ocasio-Cortez is imploding her political career right before our eyes. Late Monday she was hit with an FEC investigation, and it’s looking rather bleak. AOC’s attorneys probably put a gag order on her to refrain from commenting on the shocking charges, so the 29-year-old Congresswoman decided to defend her good buddy Rep. Ilhan Omar. 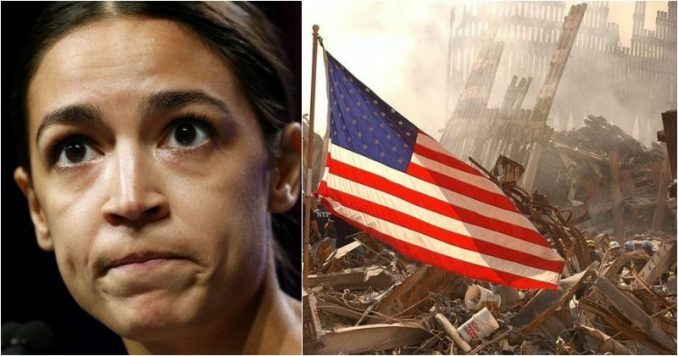 “Socialist Rep. Alexandria Ocasio-Cortez (D-NY) made radical statements Monday night on Twitter, suggesting that the United States should not have authorized the use of force against those who perpetrated the 9/11 attacks — the deadliest terrorist attack in world history,” the Daily Wire reported. After being called out for the tweet’s inaccuracies, Ocasio-Cortez clarified that she meant the Afghanistan war, and added: “(But honestly we shouldn’t have been in either, and we should end the AUMF now while we’re at it).” Note: AUMF stands for Authorization to Use Military Force. Almost 3,000 people were killed during the 9/11 terrorist attacks, which triggered major U.S. initiatives to combat terrorism and defined the presidency of George W. Bush, reports History.com Yet, for the bartender from New York, any use of force, or military intervention was not warranted. Well, as you can imagine, Americans were livid. “OMG you are against use of force against terrorists in response to the 9/11 attacks! WHAT IS WRONG WITH YOU? You do know that’s what the AUMF is right? #2020 #supportourtroops #LiberalismIsAMentalDisorder,” tweeted Johnny Clash. We don’t criticize you for being a woman. In fact that is your most redeeming qualities, darling. We just criticize the socialism and (now) the blatant antisemitism. You also said you wouldn’t have authorized force after 9/11 which is just another gaffe showing your immaturity. Alexandria Ocasio-Cortez is the Democratic gift that just keeps on giving. And it’s sure looking like the New York Congresswoman has thrown all caution to the wind as she makes gaffe after gaffe that she can never recover from. To say the most powerful nation on earth would sit idly by and not respond to the biggest attack on US soil since Pearl Harbor is beyond idiotic. The former head of Greenpeace called AOC “an arrogant little prick,” and we couldn’t agree more. Ocasio-Cortez never had any business running for office, and now we will watch as the “arrogant little prick” self-destructs before our very eyes.